A.M. was founded in 1920 by Armino Mezzo who mainly designed small cars, which are often based on motorcycles and that same year had built and launched their first vehicle, a cyclecar. It was called the Salza, a three-wheeled car, which was given the name “Moto Cor” and Tipo 7 HP in the trade. 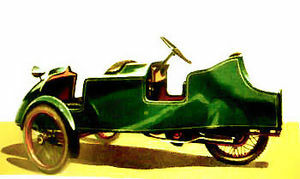 In 1921 the slightly larger model the 9 HP was added. The production lasted until 1923. Alternatively, there were these vehicles with two-or three-seat body. 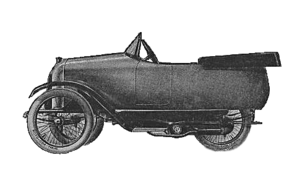 In 1924, a four-wheeled car was designed under the name of Edita. This had an air-cooled 2-cylinder engine with 1020 cc in conjunction with a three-speed gearbox. This vehicle did not go into production. Do to funds running out this forcing them to shut the doors in 1924.